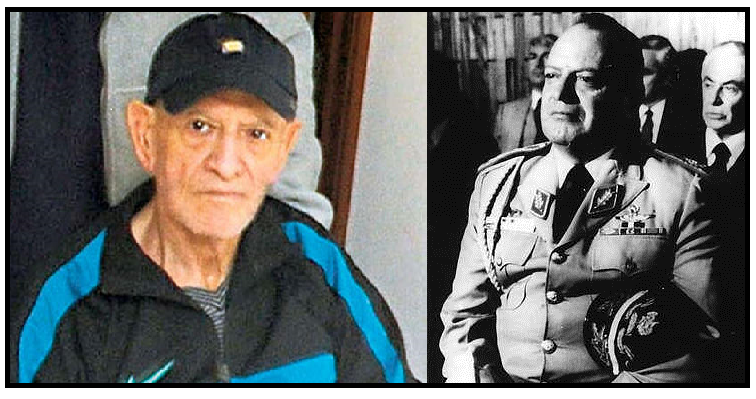 Oscar Mejía Víctores in 2011 (L), photo credit: Prensa Libre/EFE, and in 1983 (R). Oscar Mejía Víctores, Guatemalan army general and former head of state from 1983 to 1986 who presided over some of the most repressive periods in the country’s 36-year civil conflict – first as minister of defense and then as military dictator – died on Monday, February 1. He was 85. Mejía Víctores was never brought to justice for his alleged connection to human rights abuses. Due to his failing health in the years prior to his death, public prosecutors were forced to drop an indictment they had brought against him for genocide and crimes against humanity, after government doctors declared him physically and mentally incompetent to stand trial in 2011. But on the same day that the retired general died, two military men who served under him appeared in a Guatemalan courtroom for the opening day of the “Sepur Zarco” case, the world’s first criminal trial of persons accused of sexual violence and enslavement in the context of armed conflict to be heard by a national court. The trial is one of several human rights cases that have advanced in Guatemala since the beginning of this year, signaling a resumption of major human rights prosecutions by a justice system that in 2015 was largely focused on important corruption cases. Throughout his career, Oscar Mejía Víctores cut a classic figure as a loyal military officer, brutal strongman, and untouchable human rights violator. It was August 8, 1983, when as defense minister he took power in a coup d’état against his commander in chief, Gen. Efraín Ríos Montt, and became the country’s de facto leader. According to a US defense intelligence report from the time, Mejía was reluctant to assume leadership of the country but was persuaded to do so by the powerful Council of Military Commanders. He went on to rule Guatemala with an iron fist from 1983 until January 1986, when he stepped down following the country’s first election of a civilian president in sixteen years. 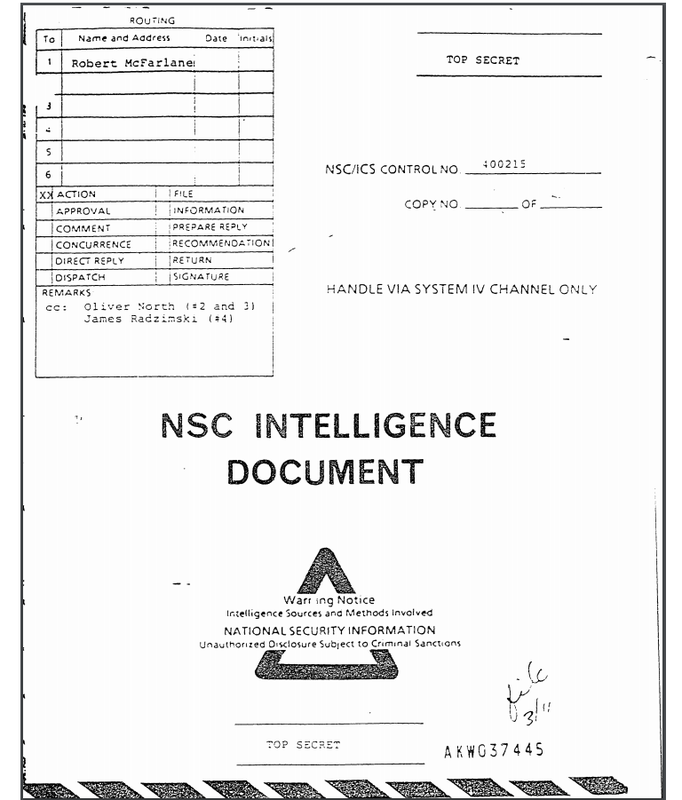 A secret October 1985 Defense Intelligence Agency report describes Mejía Víctores’ initial reluctance to assume power. During his regime, hundreds of activists, labor organizers, human rights defenders, doctors, journalists, teachers and students were swept up by security forces in kidnapping operations and held in clandestine military prisons, tortured, and secretly murdered. Some of the disappearances were chronicled in a military intelligence document known as the “death squad dossier,” leaked to the National Security Archive in 1999. Today, the case is the focus of a criminal investigation by the Public Ministry. 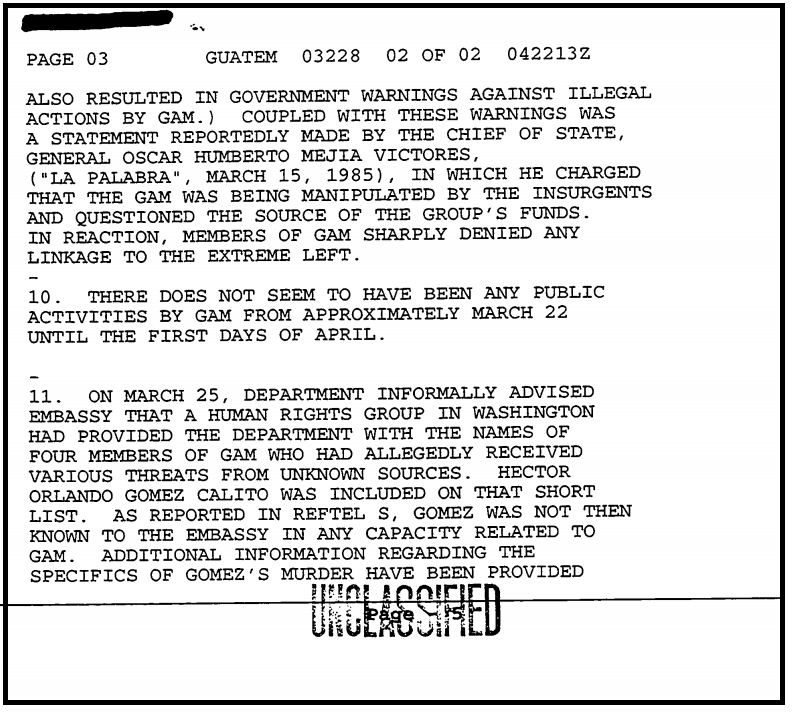 An April 4, 1985, State Department cable shows Mejía Víctores charging GAM was “being manipulated by the insurgents”. In the face of his critics, Mejía Víctores was never shy about ridiculing human rights or tarring human rights defenders with a broad brush. He called Guatemalans who had been forcibly disappeared “guerrillas,” and told relatives begging for information that they had probably left the country to start new families in Cuba or to make money in the United States. He declared that members of the national human rights organization GAM (Grupo de Apoyo Mutuo—Mutual Support Group) were “manipulated by the insurgents.” He believed international human rights groups like Amnesty International were guerrilla supporters, and once said that a US member of Congress who warned him about the country’s human rights record sounded “like a member of the EGP” (Ejército Guatemalteco de los Pobres—Guatemala Army of the poor, one of the four principal insurgent groups). From the start of the Mejía Víctores regime, the United States was ambivalent about his leadership. The Reagan administration formally recognized his government the day after the coup. But US officials were secretly dismayed that the former defense minister now ruled Guatemala, in part because of an act of state violence committed months earlier that directly affected US interests. On February 9, 1983, an employee of the US Agency for International Development (AID) and three associates had been stopped by an army patrol and taken to the main military base in the northwestern department of Huehuetenango, where they were executed. The United States pressured Guatemala to solve the crime, without success. Shortly after Mejía Víctores took power, US Ambassador to Guatemala Frederic Chapin commented in a cable to the State Department, “It should be clear to Washington that it will be virtually impossible to make progress in this matter. Not only was [former Defense Minister] General Mejía the author of the original cover up; but the officers have closed ranks on this issue…”. 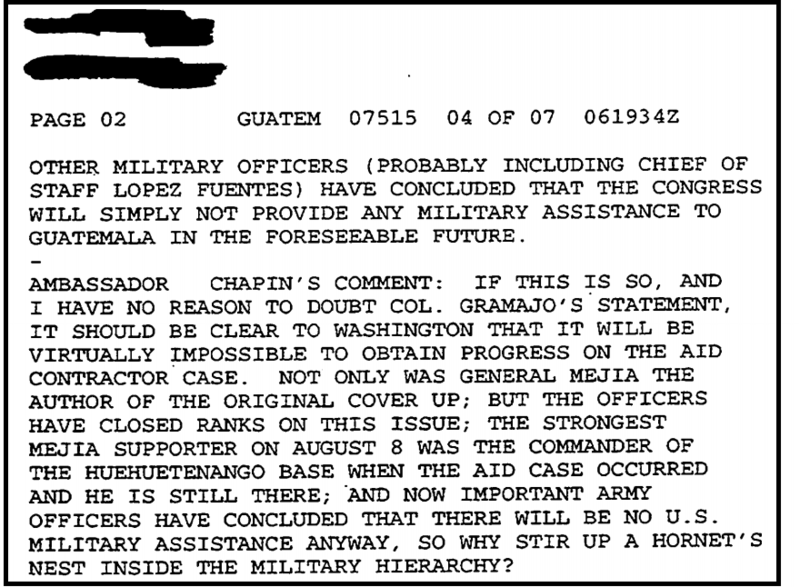 Chapin’s comments on the murder of a USAID employee and three associates in a September 6, 1983, State Department cable. But Washington limited its worries about violence under Mejía Víctores to classified communiqués. In public – in congressional hearings, press briefings and official statements – the Reagan administration staunchly maintained its support for Guatemala. At the time, Reagan was fighting a covert war against the Nicaraguan Sandinista regime and in need of allies in the region who would support the anti-Sandinista contras. El Salvador and Honduras already received tens of millions of dollars in US aid, not only to oppose leftists at home, but to provide clandestine support for the contras as well. Guatemala, barred by Congress from receiving military assistance for its egregious human rights record, was the missing piece of the strategic puzzle. 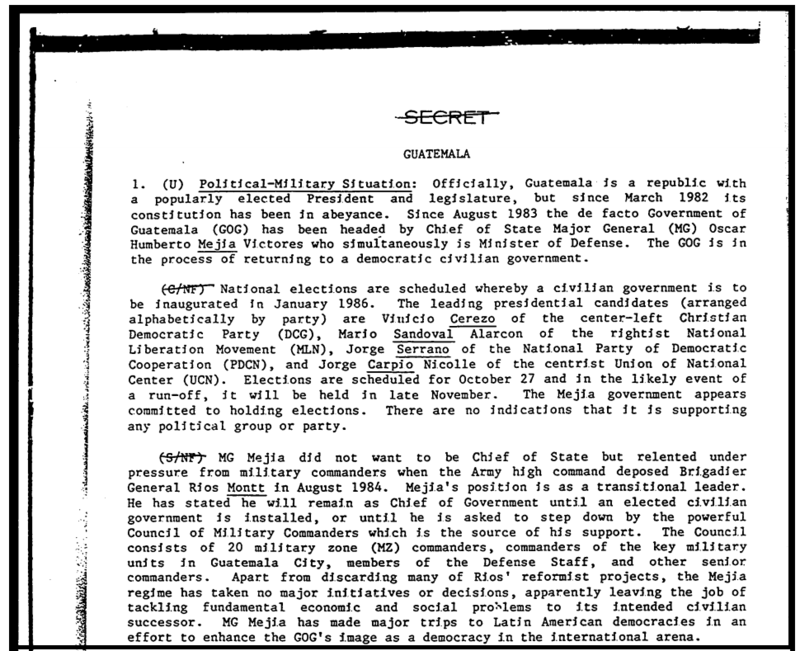 Top secret March 5, 1985, National Security Council document reveals fraudulent arms transfers to Guatemala. Although Mejía Víctores himself escaped judicial accountability, human rights crimes committed when he was defense minister and then head of state have come under repeated legal scrutiny. In the past five years, the Guatemalan government has prosecuted paramilitary, police and military personnel for genocide (Ríos Montt), massacres (Plan de Sánchez, Dos Erres), and forced disappearances (Edgar Fernando García). Now, after a lull in human rights cases, the government has resumed its prosecutions. In January, public prosecutors indicted two sets of military officers for crimes against humanity in two separate cases. In one, 11 military men – including former Army Chief of Staff Benedicto Lucas García, whose late brother Romeo was president of Guatemala in 1978-82 – have been charged for a string of assassinations and forced disappearances linked to the 558 remains found by forensic anthropologists in exhumations on the Cobán military base. During the 1980s, the base was a hub of counterinsurgency activities in the central region of the Alta Verapaces. Today the base is called “CREOMPAZ,” the Spanish acronym for Regional Training Command for Peacekeeping Operations, and serves as the locale where Guatemalan soldiers train to participate in UN peacekeeping missions around the world. In the second case, four officers were arrested for their alleged connection to the forced disappearance of 14-year-old Marco Antonio Molina Theissen thirty-five years ago. The high schooler’s abduction on October 6, 1981, is believed to have been to be an act of revenge carried out one day after his sister Emma escaped from a clandestine prison on the Quetzaltenango army base, where she had been held for ten days, tortured and raped. Although the Molina Theissen family spent decades pressuring the government for information about Marco Antonio’s fate, he was never seen again. Finally, on February 1, the trial of former military officer Esteemer Francisco Reyes Girón and former military commissioner Heriberto Valdez Asij opened before the court High Risk Crimes Tribunal “A.” The men are being tried for their role in the forced disappearance of Mayan peasant leaders and for sexual abuse and enslavement of at least 15 Q’eqchi’ women from 1982-83 at a military detachment called “Sepur Zarco” in the department of Izabal. According to human rights experts, the Sepur Zarco trial represents the first time a case of sexual enslavement as a war crime has been heard by the country where the crimes took place. Once again, Guatemala has broken new ground in its willingness to initiate judicial proceedings against human rights violators for international crimes. I remember Oscar Mejía and his band of brigands very well.